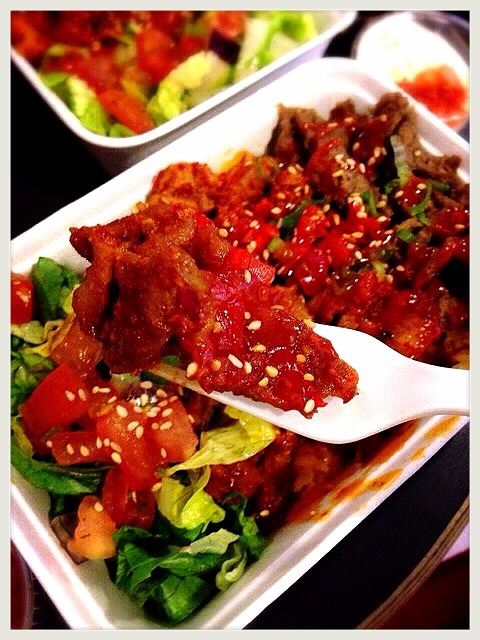 Do you like it hot at Korrito Boxpark? Posted by Diya on Korea on 15 October 2014. 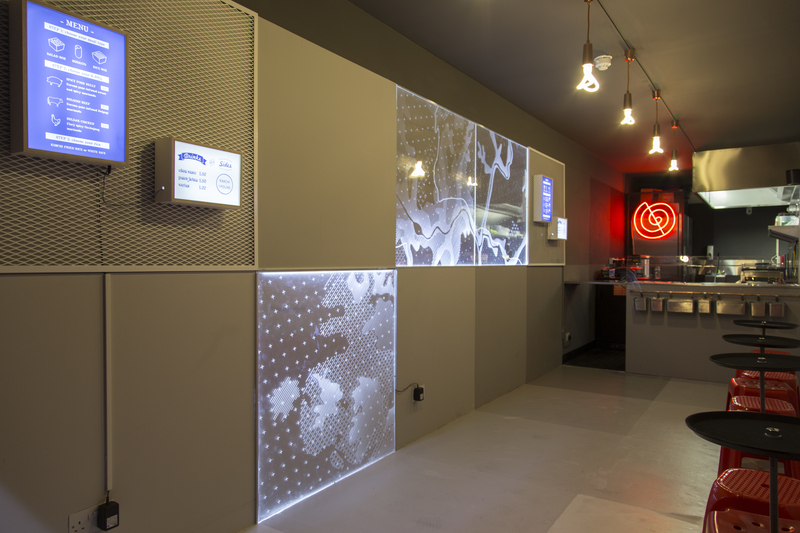 In Shoreditch, there currently sits a boxed metal construction made of stripped and refitted shipping containers housing a host of pop up stores. From a mix of fashion & lifestyle shopping brands, to galleries, cafes and restaurants, you will find it all in this very urban and industrial atmosphere. 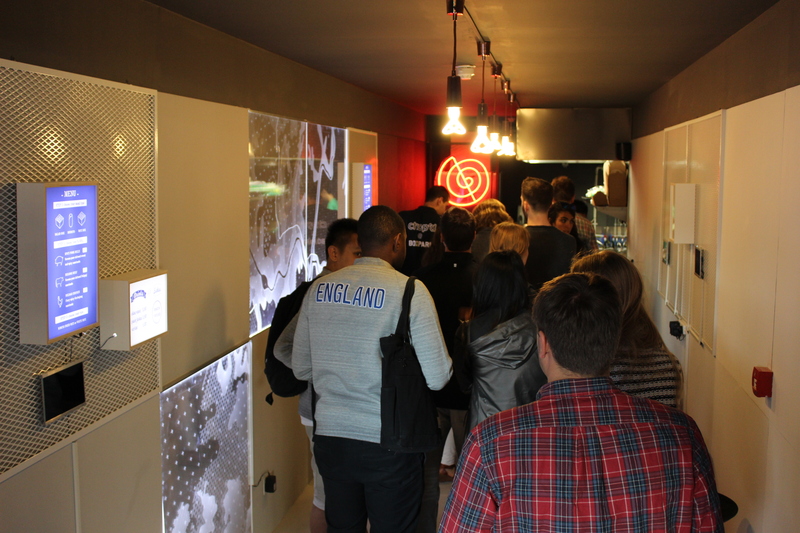 Joo, the founder of Korrito, is explaining the reason for opening in a new area. 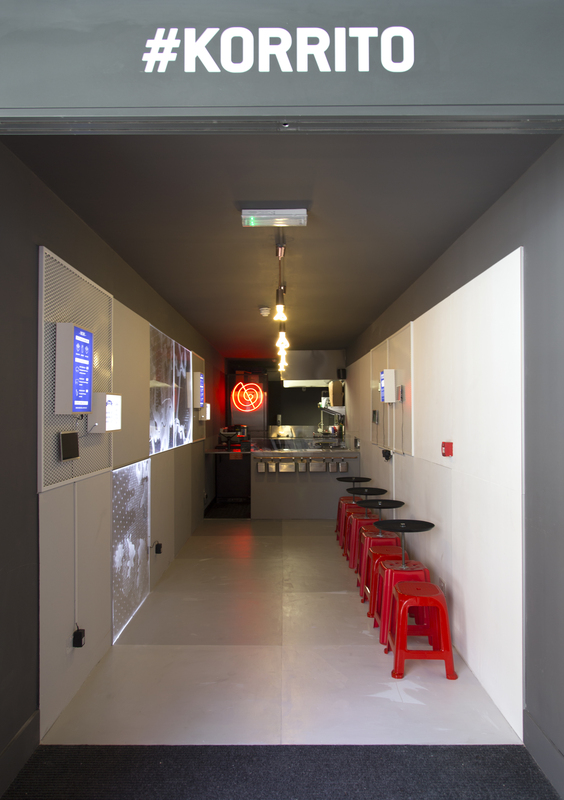 This is following my recent visit to Boxpark where I gorged on their mouth watering Korean BBQ. You are struck by the lights and signs as you enter the 40ft shipping container of Korrito’s unit. Joo explains that she wanted to capture the many facets of South Korean culture, through the informalness of street food markets, the vibrant neon lights, its technological savvy youth but also highlight the importance of tradition and simplicity. It is a lot to capture and portray in one space, but the architect Samantha Lee, who designed the unit, succeeds in doing just that! I am reminded of a scene in the film ‘Cloud Atlas’ where the future shows the urban sprawl of this futuristic city called Neo Seoul. I sort of feel like I am in this movie especially as I walk down the corridor, leading up to the Korrito unit, with cool retro paintings hung on the walls. Joo points out to me that I would have noticed the cartographic drawing of Seoul’s landscape etched into perspex and lit up as I entered the Korrito unit. It is a subtle acknowledgement of their origins. I nodded that I had. I loved the ambience and the custom made red stools and chairs that gently beckoned us, as I wandered in with my friend, to sit inside. I had eaten at Korrito twice before. Once at the Savouring Korea event, where Joo had launched her three part documentary series and a second time when I had visited Southbank on a Sunday evening. This time it all seemed different. Could it be down to the fact I had decided to stuff my face not with one, or two, but three kinds of meat? Chicken, Pork and Beef!! This was the very helpful suggestion of Peter, the manager of Korrito, when I had drawn a blank as to what I wanted to order from the menu. I had also chosen this evening to break a three month diet of pure vegetables and fish. What a way to celebrate! All three meats were placed on a tasty bed of kimchi rice and salad as I had gone for the rice box option. We also ate the two side dishes of kim spring rolls and half-moon dumplings along with the little Kimchi pots. The kim spring rolls were crispy seaweed rolls, when dipped in soy sauce, exploded in my mouth in sheer gastronomical delight. 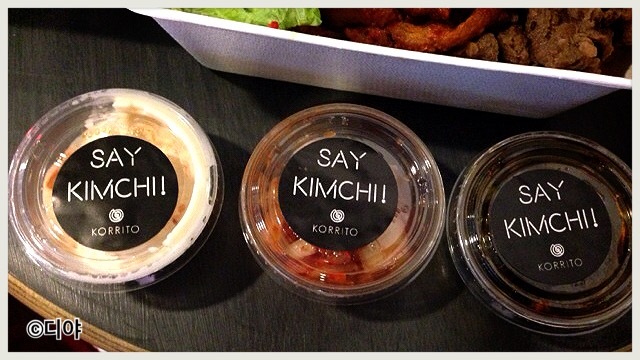 As well as soy sauce pots and kimchi pots, we also had little tubs of Garlic mayo with added kimchi in them! I could have consumed this entirely on its own, it being so tasty. The rice boxes we’re washed down with a bottle of Hite beer and a can of Korean Pear Juice. This had delightful little bits of pear inside and was very refreshing. The cute sauce pots, that say ‘Say Kimchi’ on them. I certainly know my thoughts on the venue and the food, but what do others think? There are a lot of new exciting things around the corner for Korrito. They are planning to introduce ‘Dukbokki’ to their side dish line up and already my mouth is drooling. It is a typical snack food that you can eat from most street vendors in Korea made of soft rice cake and fish cake with chilli sauce. This is the perfect dish for Korrito, but you just know they are going to add their own unique twist to it. Korrito have also been working on their own online delivery platform on a new website they are building. 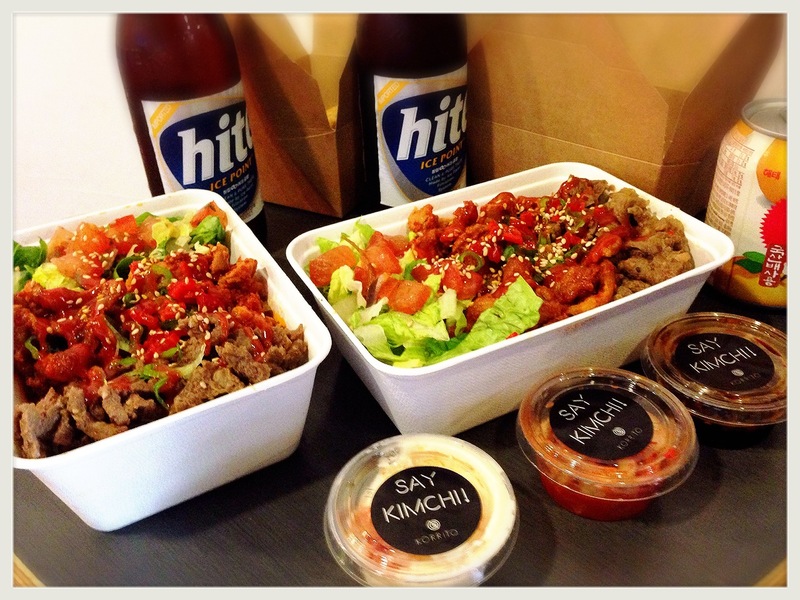 They have piloted lunch time deliveries for Joo’s old colleagues in the city and it has really gone down well.The demand of Korean BBQ is spreading. Furthermore, they are also trialling out a new venture called Happiour! Throughout the next two months Korrito will be offering discounts and deals through this new and exciting app, Happiour. This is downloadable through the Apple app store and has been inspired by the idea of making the traditional Happy Hour concept into a digital and shared experience. It highlights exclusive offers and events that you will want to know about in top bars, cafe’s and restaurants around London and it does all this in real time. It allows you to share this with your friends too! Download the app and throughout October and November on various days, expect to hear about free sides with your meal as well as and two for the price of one options. It is already on my phone and I am patiently tapping my fingers together in eager anticipation. Thank you to Joo, Peter and the team at Korrito for a truly delightful experience at Boxpark.